To our friends at Jet Blue — well, you guys warrant a post of your own. It will come soon; I promise. Because the autism community needs to know who our people are. And you, my friends, are our people. Security was hell. It just was. We’d been at the airport for two hours by the time we headed over. We’d shopped for Harry Potter souvenirs for Katie, we’d played on the iPad and then finally, we’d found a quiet corner at the Macaroni Grill for dinner. The time had passed mostly without incident. But Mama had screwed up. Because all of it – the shopping, the restaurant, the wide hallways through which Brooke rode atop my rolling suitcase – were all on the wrong side of security. And I was so focused on keeping her occupied and calm that I forgot. Yes, I know how ludicrous that sounds. But I was exhausted. And I forgot. Which meant that we had to hurry. And hurry and autism don’t mix in our world; they combust. So when I said, “C’mon, baby, it’s like a race,” my girl wasn’t buyin it. And when she had to go through the metal detector without me and wait for me on the other side, she really wasn’t buyin it. And when it went off because she touched the wall on the way through and the TSA agent bruskly told her to turn around and do it again, she REALLY wasn’t buyin it. And when I tried desperately to stay calm and to gently and clearly explain to her what she needed to do and the TSA agent looked at me as though I’d just stopped and ordered a filet mignon and barked, “She just needs to walk through again; not asking a lot,” I nearly lost my stuffing. But there wasn’t time for stuffing losing because we had a plane to catch. And we were nearly out of time. Jet Blue had promised us Silent Boarding – the miracle accommodation that had made boarding the flight down seamless, comfortable, and dare I say, easy. But we had to BE THERE to board ahead of the other passengers. The flight was at 7:15. Boarding would begin at 6:45. By the time we’d walked through that damned metal detector four times it was 6:39. We were THISCLOSE. I told my girl we needed to hurry. Again and again. She balked. Again and again. The wheels were coming off the wagon. I was holding us both together with duct tape and string. But as we got closer it became clear — THERE was a nightmare. THERE was everything that Silent Boarding was designed to avoid. THERE was a triangular throng of people gathered at the gate, waiting with their engines idling as if on the starting line at the Grand Prix. I tried to stay calm. For Brooke, there is nothing more necessary than Mama staying calm. I tried to convince my girl that we’d be okay – that she just had to stick with me and we’d be all right. We snaked our way through the crowd, one Excuse us please at a time. A child coughed and Brooke screamed. She pulled me down to her for a sensory smush kiss. It had all been too much. I looked above the heads at the clock on the wall. 6:45. Exactly. It was time to board. My heart sank. We were too late. I expected annoyance. I expected frustration. I expected what we’ve all grown to expect from interactions with so many overwhelmed and pissed off gate agents who have simply had enough. What I got instead nearly broke me. My mouth hung open. I wiped the sweat from my forehead. I had no idea what to say. I stuttered something about security, A tough time, my girl, we … it .. it was hard. I’m sorry we’re late. Thank you. I’m going to cry. I had no words. She was going to hold off on boarding the entire plane to make sure that my girl was okay. I thanked her. It was all I could manage. The flight attendant welcomed us – handed us bottles of water. The generosity was almost too much. As Brooke settled in with her iPad, I grabbed my phone. I needed them to know. Of course they wrote back, as they always do. I am so grateful. To Michele, whose timing could be called nothing less than divine intervention, and whose work made all of this possible. To the people at Jet Blue, for listening to a mom whose son had an awful experience on a flight and asking how they could help. For then listening, and making things different. Because that’s how this works, isn’t it? That’s how the world changes. When we speak up – either on our own or our children’s behalf and say, “This could be better. This needs to be better.” Michele spoke up. The people at Jet Blue listened. And our kids – all of our kids – and us – all of us – benefit. Since sharing our experience, I have had more people than I can count tell me that they never thought that they could fly with their autistic children, but that they might give it a shot now that they know. To the folks at Jet Blue, I hope you know how much that means. That means that you are opening up the world to these families. Visits to grandparents, trips to Disney World to meet beloved characters, family reunions — everywhere and anywhere that you fly, they can go, because you listened. That’s a gift beyond measure. Ed Note: Just a reminder, I am not affiliated with Jet Blue in any way, shape nor form. I am simply sharing our experience because, as I said at the top of the post, the autism community needs to know who our people are and they are, without a doubt, our people. 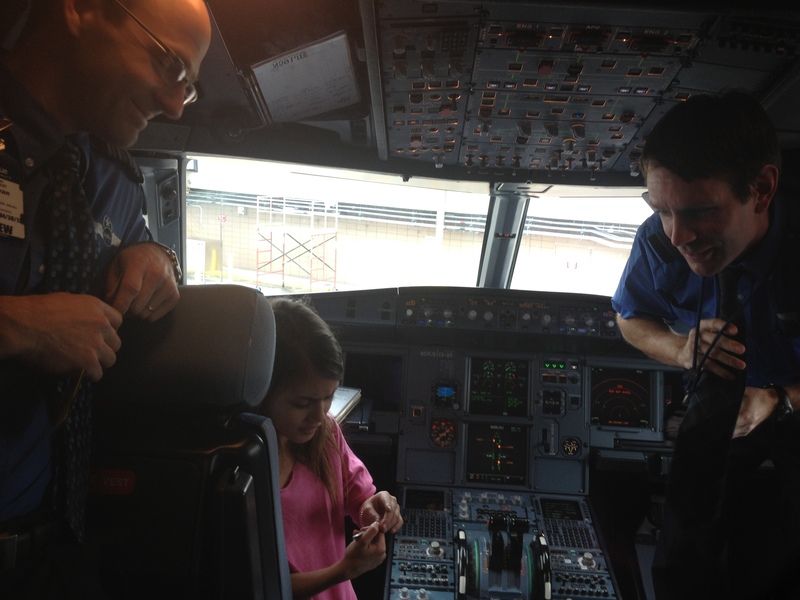 Thank you, Jet Blue, from a grateful Grammy. You’re the best! Honestly, Jess, I am so cynical about so many things customer service in our world, ESPECIALLY travel-related things. This chokes me up knowing that there’s a business out there that still cares. Honestly. This really is so good to know. My in-laws want us to visit them this summer and we would be flying from Fl. to Houston-about 5 hrs. on a plane. The last time we did this, it was so overwhelming. We haven’t flown since. I hope that the main airlines that flies to Houston (plus in-laws have vouchers for us) will do the same as JetBlue. I hope “our people” use Jet Blue and reinforce their caring and sensitivity. This good turn should be rewarded by all. I wish more companies would also get onboard. I’m glad it was a great memory. i am flying for the first time to DisneyWorld with my 3 kids next wednesday (my oldest with pdd-nos) and flying jetblue. I called the special assistance line just to notify them of my son, so if he was having a difficult time, I wouldn’t have to explain to 5 different people what was wrong. I was shocked when the operator basically offered us the world, and then said “can you think of anything else we can do to make this as smooth as possible for your family?” The world needs a whole lot more JetBlue. I won’t fly with anyone else……ever! She also told me that you can also call TSA and let them know beforehand also, Jess, just FYI for next time! I’m so glad that you had & have such good experiences traveling by plane. It sounds like Jet blue has some phenomenal customer service!! In tears reading this. Oh how I WISH Jet Blue was out here in Minnesota!!! In tears as well! Security is horrifying. I relived that situation in your description. My son ran off while I was randomly searched… and I was just going please, please be quick although that is the last thing you should say to the security guys. No one cared why I was so desperate. All ended well though and we have flown a few times since. I was happily reading along, feeling the tension rising, until…BAM! THe floodgates on my tear ducts opened. WIDE. From now on, I will always choose Jet Blue if it’s an option. WOW. I just may have to check out JetBlue next time we travel. Awesome sauce!! P.S. We have had to walk through security several times because of my son touching the sides of that damned machine, too. Arch. Oh wow, I’m in happy tears. This is so wonderful and gives me so much hope. I had started to fear we’d never get to visit our family and friends again. I cried right along with you when the gate agent welcomed you on the plane. I’ve felt that guilt of waiting too long, then having to rush. That anger when the TSA agent (shoe salesman, cashier, other parent) just didn’t get it but felt entitled to judge. The cringe that follows the child coughing (car honking, dog barking, whistle blowing), knowing that a meltdown is sure to follow. I could feel (have felt, so many times) the immense weight of all those emotions you had bottled up inside because “there is nothing more necessary than Mama staying calm.” And then that flood of relief when someone shows a small kindness that, in the moment, means the world. Jess – once again thank-you for sharing . We are planning to fly from canada to England this spring . You have inspired me to get on the phone and make some inquires to how we can make this a good experience for our daughter is ASD PPD . It’s a shame that JetBlue doesn’t fly from Canada. They get it. I don’t know what they did to get this far but they really get it. I’m going to look at that link right now. “We were wondering where you were!” she said with a gentle smile. “Are you guys okay? We were waiting for you.” Tears…rolling…down…my…cheeks. TSA does have a hotline and will assist in getting special needs families through the security process. We used it last year in Hartford and they literally walked us right through. Orlando was not as great an experience though. And don’t beat yourself up about spending too much time before security. It’s always so hard to judge when to get in that line: everything interesting/tasty/entertaining for kids is before security, and so often, slim pickings by the gate. So you often have to just guess how much time to allot to each…and the security line itself is usually a big unknown as to how long it will take to snake through until you actually make your way there–it’s difficult for anyone to gauge. I’m happy Silent Boarding worked as well for you as I hoped it would! We also had a great experience with Jet Blue Hartford to Orlando and back. Everyone should call TSA Cares and they will help you through security as well! Our TSA officer even brought us our shoes! made our trip much less stressful. I’m a BIG jet blue fan. I’ve never had anything but good experiences with them. YAY! ahhh…this brought tears to my eyes. Thanks for sharing.